Your kids probably already have too many stuffed bears, and sweets will come home in abundance from school. Ditch the fluff and the chocolates and celebrate Valentine’s Day with this heart-filled game that you can make together, then play together. 2. Open up the heart shape cut-out and draw out board game lines. You will need two vertical and two horizontal lines. With your pencil and ruler, make the pencil lines first to fit your ideal sized heart game pieces. When you are ready, trace pencil lines with the black sharpie marker. 2. Thread the needle with the opposite color yarn and knot the end. Insert the needle through the FRONT piece only, a quarter-inch from the bottom point of the heart, so that knot is inside the two pieces of fabric. Then, sew the outside edges of each heart together using a blanket stitch, leaving about 1.5 inches unstitched. To do a blanket stitch, start the needle at the back of the fabric, and come through the front. Start another stitch [Step 1 photo] going from back to front, a small space down, but only pull thread through until a small loop [Step 2 photo] remains. Bring the needle through the loop from back to front [step 3 photo ] before finally tightening it [steps4/5photos]. Repeat. 4. Insert cotton balls through your small hole inside the heart for a pillow-like appearance. 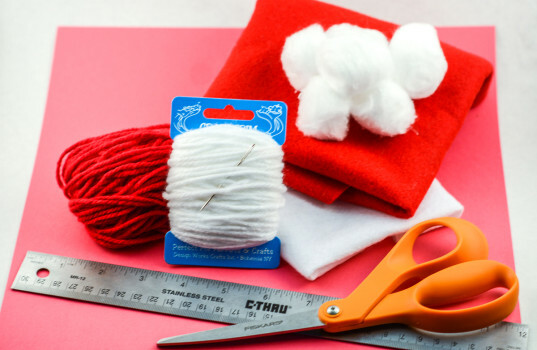 Once filled, continue to sew the heart closed using your blanket stitch. Finish by knotting the yarn where it will be most hidden. 5. You should have a total of 10 heart shaped pieces, 5 in each color. Give each player a set of hearts in one color, and enjoy the classic game of Tic-Tac-Toe!